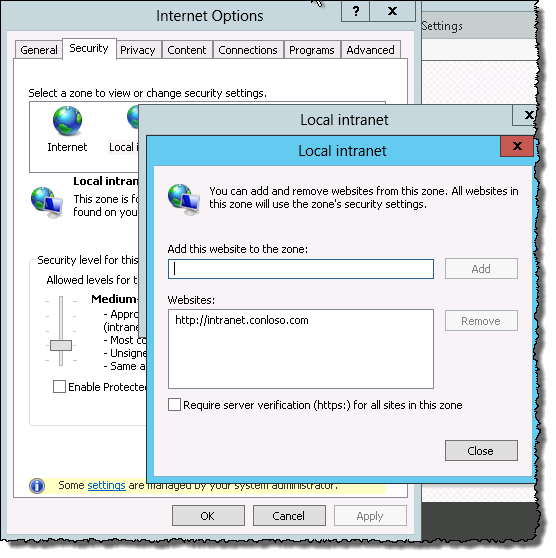 A simple fix is to add the url of the site to the Local Intranet zone or Trusted Sites zone in Internet Explorer. From Internet Options, select the Security tab, select Local Intranet zone (or trusted sites zone). Click Sites, and add the site under Advanced. There are many blogs out there dealing with this issue, as it’s not a new issue at all. However, I’m adding it here for my own record as I run in to it more than I would like. For the most part it’s related to permissions and the service will eventually return to stopped mode. However, there are situations where it truly is stuck on Starting. Once the service instance stops, you can attempt to start it again from the services on server page. Lets say you have a publishing site. and lets say you want to create a search center as a sub site. You might go to Site content page and click New subsite. And then you might look under the Enterprise tab for the enterprise search center template. Once that’s activated, then you can create an enterprise search center as a subsite. After I created the root site collection, I was then able to get to my newsfeed. There are many guides on configuring SharePoint manually, automated with PowerShell, and so on. And here’s another one . This is not a fully detailed blog (easy reading), but rather to have you take pause and get the basics ready before mounting that iso. If you are doing a production install, then you will want to do full architecture planning for hardware requirements, capacity planning, load balancing, service continuity, etc. We’ll keep that for another post . 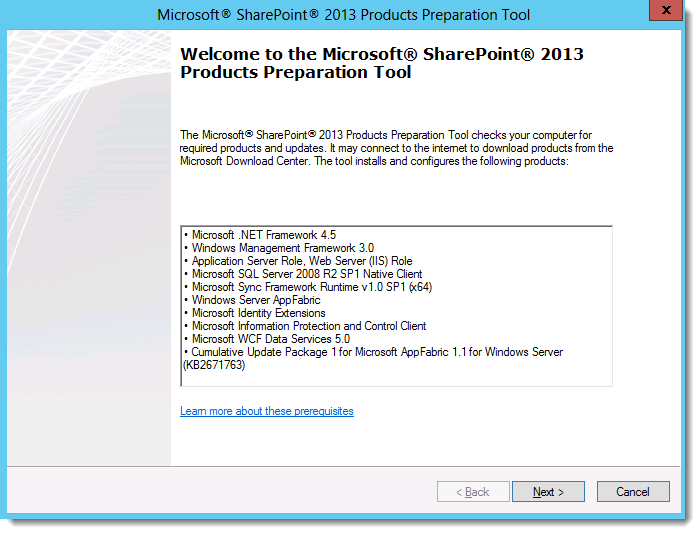 I see time and again users jumping straight into SharePoint install by mounding the iso, and clicking Install SharePoint. Even if you are setting up a test or developer environment, it is worth doing right. Before we get started in mounting the iso, we want get a few things taken care of first. We need a few service accounts, we need to do some SQL configuration, and we need to get our SharePoint server(s) ready. TechNet has a post on hardware requirements that should be reviewed. While these are good minimums, I typically increase their recommended memory allocation by at least 50%. If you are building out a dev/personal environment, you want to give it 8Gb if you can, and 60-80Gb for OS drive. For SQL, again if it’s a dev environment, you can get away with 4Gb, but for a production you want to start at 24Gb. If you are planning to install SQL on the same server as SharePoint then you would need to account for this in your memory allocation. I would never recommend that you do this, unless it is a very simple kick-the-tires situation. See this post on setting this property. In order to allow the SharePoint server to connect to SQL, you may need to configure the windows firewall to allow the connection. SQL connections are made over port 1433. So we have our service accounts and SQL server setup, all we need is to prep our SharePoint servers and we are good to go. Tempting as it might be to just use the domain administrator account to install SharePoint, do not. Now is the time to start getting into the habit of using dedicated functional accounts. 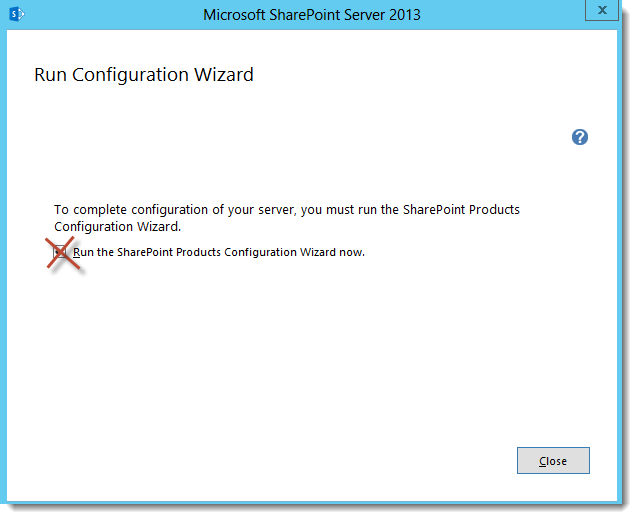 Give your install account local admin permissions so it can logon and do the SharePoint install. If you have any other recommendations, please let me know in the comments! SharePoint needs a bunch of installs on the server before we can actually lay down the SharePoint bits. Luckily, the prerequisites installer provided with the SharePoint iso takes care of installing and configuring them all. Mount the SharePoint iso and start autoplay. Click Install software prerequisites to get them installed. 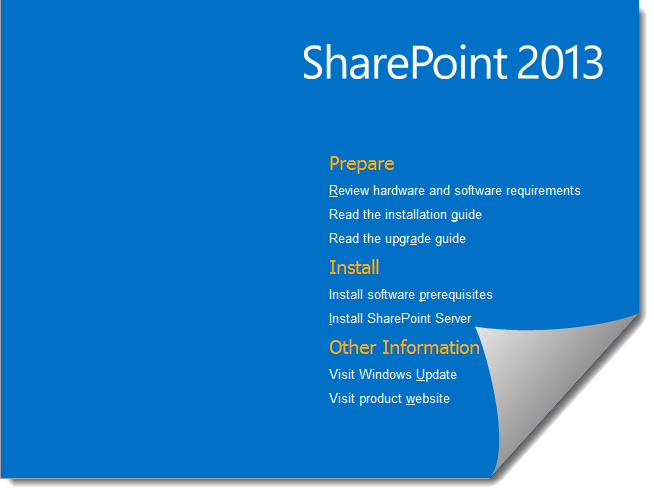 Once the prerequisites are installed, we can proceed with SharePoint by clicking Install SharePoint server. Ok, you made it. You are ready to install SharePoint!! 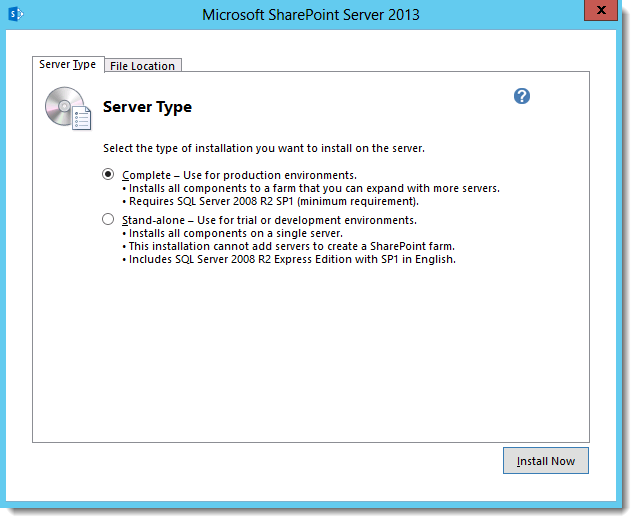 Back at the SharePoint 2013 splash, click Install SharePoint Server to get rolling. Rather than use the SharePoint configuration wizard, we will use PowerShell to configure the farm. In the past, I have run a custom script to configure the farm to Central Admin (and then separate scripts to configure services). There are many blogs out there covering that topics, but I recently discovered AutoSPInstaller (thanks Jody Finch ). I have yet to try it, but it looks promising! After getting everything installed and configured, check your windows updates. At time of writing, the March PU (public update) was available for download. See TechNet for more details.